Alternative treatments are often used alone, while complementary treatments are alternative treatments that are used in combination with traditional treatments, such as drug treatments or surgery. Botanicals are medicines that are derived from plants. They have been used for centuries by "folk healers" and are the foundation for nearly half of prescription drugs used today. Botanicals in the form of herbs and nutritional supplements make up a large part of alternative therapies. Can botanicals relieve menopausal symptoms? 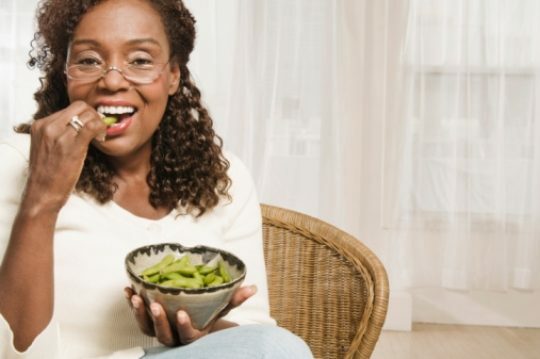 Some botanicals, such as phytoestrogens, may help relieve symptoms of hot flashes. Phytoestrogens, found in plant-based foods, are substances that are thought to have weak estrogen-like effects. They may work in the body like a weak form of estrogen. Some may lower cholesterol levels and have been suggested to relieve hot flashes and night sweats. Examples of plant estrogens include isoflavones. Isoflavones can be found in foods such as soy products, whole grains and beans. It is important to remember that not every woman is able to convert soy to equol (weak estrogen). Also, choose soy foods rather than supplements. Black cohosh is a botanical that is widely available. The most well known brand is Remifemin®. There are some studies that suggest black cohosh may be helpful in the very short term (6 months or less) for treatment of hot flashes and night sweats. However, most medical experts aren’t sure of the benefits of black cohosh as the studies are poorly designed. Side effects include gastrointestinal upset, nausea and may cause liver toxicity. Evening primrose oil is another botanical that is often used to treat hot flashes, although there is no scientific evidence to support this. Side effects include nausea, diarrhea and blood clots. Many women with other conditions, such as seizures, schizophrenia, or those on blood thinning drugs, should not take evening primrose oil. Evening primrose oil may also help reduce breast tenderness. Flaxseed is a plant-based food that contains lignans, another class of phytoestrogens. Although there is no scientific evidence to support this, flaxseed is thought to decrease the symptoms of menopause, particularly hot flashes. In addition, some studies show that flaxseed may lower breast cancer risk in women, and may help lower cholesterol. Also known as linseed, flaxseed is available in both whole seed and seed oil forms. However, only the crushed or ground forms of flaxseed contain lignans. More research is needed to determine the safety and effectiveness of botanical treatments. To make an informed decision about the use of these treatments, be sure to discuss them with your doctor. Source: Be wary if the product is only offered through one manufacturer or purchased only through a health care provider’s office.